Did an Indian omelette really cure my hangover?? 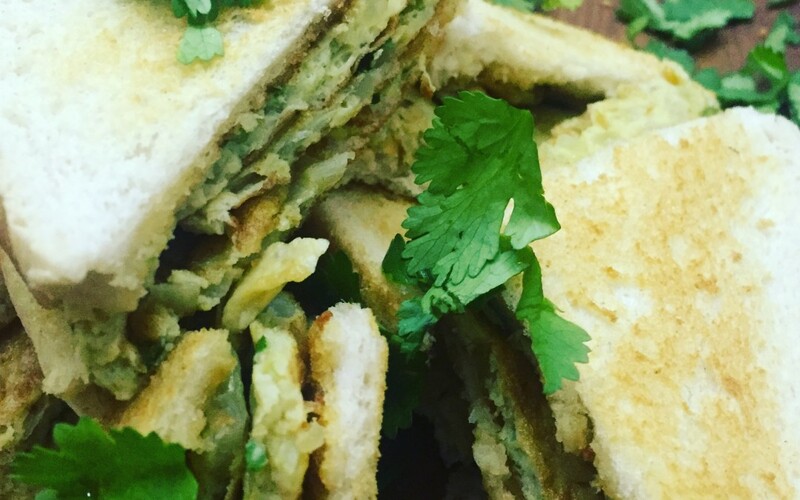 An Indian omelette sandwich is something I grew up with. It takes me back to my childhood and I wanted to share this recipe with you. We would have Indian omelette sandwiches at weekends, or when mum couldn’t be bothered cooking an extravagant meal. We could never take this as an alternative sandwich in our packed lunch as the aroma would engulf the dinner hall at school and we’d be a laughing stock. We would usually have omelette on Sunday for brunch. (It was a great hangover cure from a heavy night boozing and clubbing at university). Often it would be a masala omelette sandwiched between two thick slices of toasted white bread and a generous dollop of Heinz ketchup. I would accompany this sandwich with a steaming hot cup of masala tea and an extra teaspoon of sugar. It was a pick -me-up to give me the energy to shower, get dressed and head back to the pub. Now, many years later, I am not encouraging binge drinking or irresponsible drinking behaviour. This is just my experience I’m sharing with you. Indian omelettes are coming back in glorious style as street food is becoming a lot more popular and fashionable. The dodgy omelette stall is shifting to high end restaurants without the fear of getting Delhi belly. There are so many variations of an Indian omelette. Mine is rather simple compared to others but I feel there is enough flavour to make this a favoured choice. If you’ve been lucky enough to have visited India and come across an omelette stall you’ll see how vendors would load the omelette with copious amounts of dried masalas and chillies – well what you hope are dried masalas -, which I don’t believe suits a modern and refined palette. Don’t get me wrong. I have visited these stalls and I always respect hard working individuals trying to make a living. But I think they’re more suited to an Indian palette rather than a British -Indian one. Why don’t you give my Indian omelette a try and see! !